Today, July 25th, is Lama Kunga Rinpoche’s birthday. His Dharma students wish him a most happy and healthy birthday. We are grateful for his presence, his assorted teachings and empowerments, his kindness and guidance, and particularly for putting us on the Buddhist path and maintaining it. Rinpoche, we prostrate to you, and thank you, and request you to remain with us for a long long time. We supplicate you to live long. Lama Kunga Rinpoche is very happy that his recent health concerns have not upended his desire to transmit the entire sequence of the 21 Tara empowerments. This is such a unique opportunity. After transmitting this to a group of students in Hawaii last year, Rinpoche is excited to offer this series for the first time in the Bay Area, at Ewam Choden. Though, given his recent events, he has rescheduled the event to Oct 1-7. Please CLICK HERE for more info. Rinpoche-la is so very deeply touched by all of the well wishes and prayers, and welcomes the continuing offerings as he heals. And for those person who wish to do more via an offering, though not necessary, in lieu of cards, flowers or gifts, Rinpoche-la asks that donations be made to his most current passion, Tharpa Choling Retreat Center. Checks should be made payable to Ewam Choden, with a note referencing the intention of donation to the retreat center. Established in June 2008, Tharpa Choling is not an independent entity, rather the newest component to Ewam Choden. Please check back often as to its progress! As soon as he can, Rinpoche will be back up to Tharpa Choling for healing and overseeing the completion of the new Shrine Room, yet another gift from him to us all! CLICK Here to be forwarded to the Retreat Center section. It is July 16, four days since Rinpoche was admitted for stomach ulcer, and the day after his release! I will start the post by including a recent email to EC membership, from our Treasurer and dear friend to Rinpoche, Robin Tickner. Also, Medicine Buddha is one of several sadhanas that we have on the website for download. CLICK HERE and a separate window will open with that page. Thank for all for your prayers for our precious Lama Kunga. I am pleased to report that he is much better and may be allowed to go home today, but tomorrow for sure. I was at the hospital this morning when the GI doctor came in. He confirmed that the stomach ulcer was small and should heal without further risk now that the blood thinning medication has been stopped. He did take a biopsy of the ulcer yesterday. The test result will take 7-10 days. They are looking for evidence of the bacterium called h – phylori, which is known to cause stomach ulcers. This would be a good finding because it can be easily treated with a course of antibiotics. Even though Rinpoche has passed this crisis, he still has serious health issues which will need careful management, including diabetes and an irregular heartbeat. The blood thinning medication was used to prevent the formation of blood clots, a common side effect of an irregular heart beat. A blood clot which gets loose and travels to the heart muscle or to the brain can cause a life threatening event, such as a heart attack or a stroke. Rinpoche’s doctors have taken him off this drug for 6-8 weeks while the ulcer heals. They will then evaluate what medication (if any) to start. So please continue to keep Rinpoche in your prayers. Once Rinpoche gets home, he will need to have lots of rest and time to recover. We will be setting up a visiting schedule so he can still see visitors but not become overtired or over stressed. I know you will all want to cooperate in allowing him uninterrupted periods of rest. 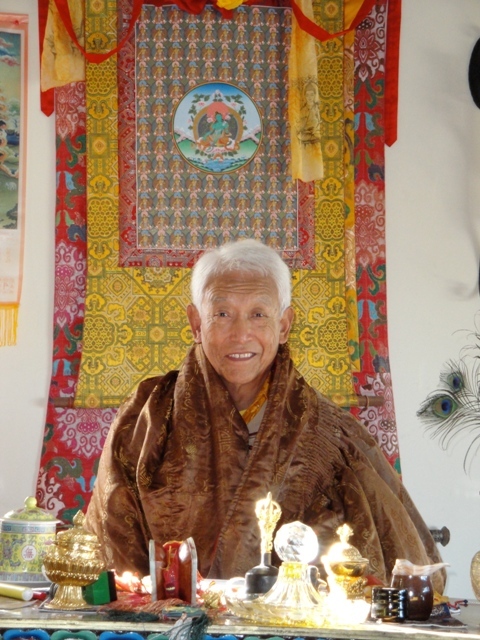 Several of you have asked what you can do for Rinpoche at this time. The best thing is to continue your prayers. If you feel you would like to do something special, Rinpoche would appreciate a contribution towards the support of the retreat center, Tharpa Cho Ling, which is so close to his heart. Some of you have already done this, or made a pledge and we are most grateful. Thank you very much. Also many of you know that Rinpoche’s birthday is July 25. At this time we do not know if we will be going ahead with plans for a party. It be just too much right now. I will try and keep you all posted when I know more. Birthday cards are welcome, but Rinpoche would prefer contributions for Tharpa Cho Ling in lieu of presents. Again, thank you. Personally, this has been a real whack on the side of the head for me. It scared me half to death thinking how close we came to losing him. They had to give him 4 pints of plasma and 2 pints of whole blood before the bleeding stopped. Terrifying. It made me realize how important this precious human life is, both Rinpoche’s and my own, and that I should not take this opportunity to practice Dharma for granted. Whack! Thankfully our precious teacher is still with us, and we with him. I know all the prayers for him were seriously beneficial. I’m proud to be part of this sangha, this amazing group of students and friends dedicated to Rinpoche’s health and happiness, and to his life’s work serving the Dharma. May we all be blessed to remain here with him for many years to come. 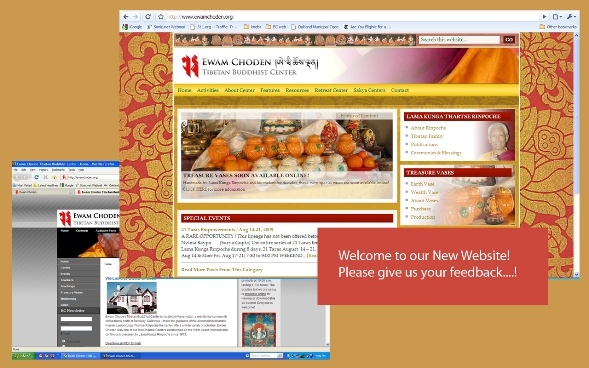 We have finally done it – Ewam Choden has a new website! CLICK HERE to give us your comments. 21 Taras Empowerments / Oct 1-8, 2009 —– Coming Soon! This lineage has not been offered before by Lama Kunga Rinpoche at Ewam Choden. This entire series of Taras Empowerments will be offered by Lama Kunga Rinpoche over 8 days, at Ewam Choden Tibetan Buddhist Center in Kensington, California. As the embodiment of the Great Wisdom Loving Mother, Green Tara of the Sandalwood Forest, the principal Tara of the 21, is the savior of all beings. She swiftly comes at the calling of her name in times of danger and delusion. She manifests into 21 Taras or aspects embodying such qualities as wisdom, compassion and power. Her powers include transforming fears, removing obstacles, curing disease, bestowing wealth, and dissolving ignorance. The empowerments of the first principal Tara and the last Tara, the Tara of Complete Perfection, maybe taken separately by people who cannot attend the entire series. You may sign up for one or both of those two empowerments. NOTE: PARTICIPANTS SHOULD FOLLOW A VEGETARIAN DIET WITHOUT GARLIC OR ONION ON THE DAY or DAYS OF THE EMPOWERMENTS. Pre-registration is required. Please register early! $375 early registration by Sep 1st. In the event of cancellation, all who pre-paid will be notified and receive a FULL refund. The fees helps fund the Center’s charities and activities. 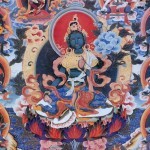 The Dana (donation) to the Lama is separate and should be offered at the end of the ceremony.